The primary difference between account schedules in Classic versions of NAV (NAV2009 and prior) and Role Tailored versions of NAV (NAV2009 and later) is mostly navigational. Most of the ways we construct row setups and column layouts have remained the same, but getting around the software is significantly different. Filtering is one of the areas where we see this the most. When filtering an account schedule in Classic versions, you have some very basic options to select your dates, budget, dimensions, and very little else. When filtering an account schedule in Role Tailored versions, you’ve suddenly got a whole new world of possibilities. 2009RTC makes things a little complicated, making us move through an additional screen on our way to the account schedule overview before we can apply additional filters once we get there. This has been my least favorite iteration of account schedules filtering because so many of the filters reset when you leave the screen, requiring you to continually redefine them when you come back or cheat the system by changing the work date in order to keep your sanity. 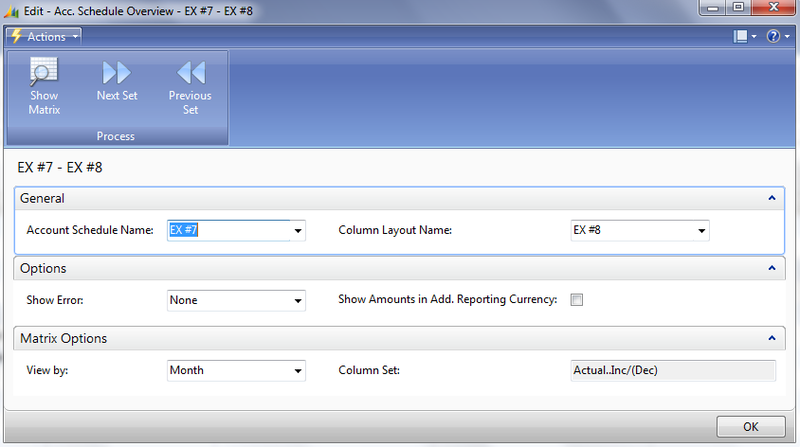 NAV2013 makes it all better with some great improvements and overall simplification. The new filtering eliminates the additional screen on the way to the overview, taking us directly there instead. The filtering is a nice improvement, keeping the frequently changed options up top and the set and forget filters on the bottom. The most important thing of all is that the next period and previous period buttons are back, allowing you to quickly change periods without having to type the full date in. A nice new feature that lurks in the background are the previous and next column buttons. You’ll think you’ll never need them until you have an account schedule set up with more than 12 columns. 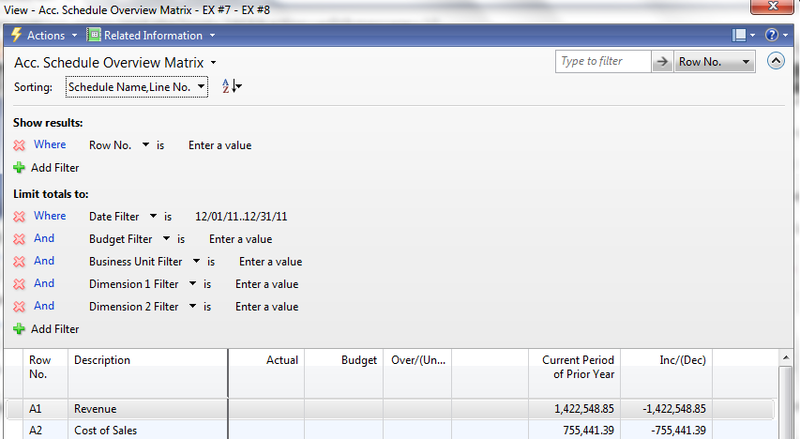 The new freeze pane option is nice, but it decreases the number of columns available in your view. Use the shiny new next column button to see the rest of the info you need.